Sequencing is an important step for students to take before being able to retell a story at a reading conference with the teacher. 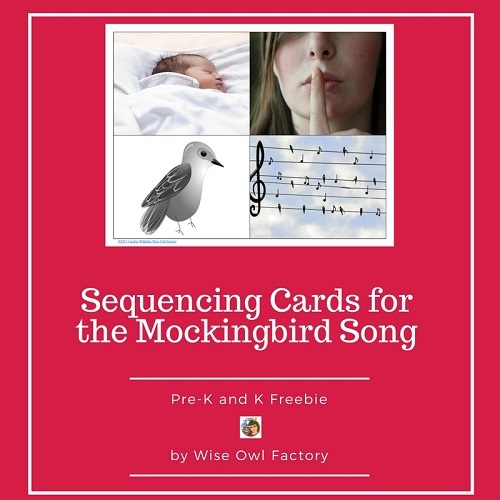 Sequencing familiar songs and stories provides scaffolding and builds on prior knowledge to enable success. 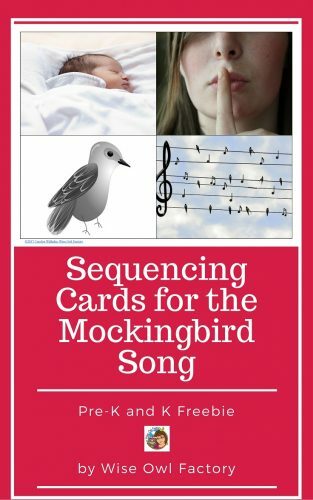 You probably know the Mockingbird Song, and these cards will help with several variations of the song easily found online. It is a traditional lullaby and the author is unknown. For a few days, some classes will respond to the cue, “Hush, little baby” with a smile and being quiet. Of course, that won’t last too long! 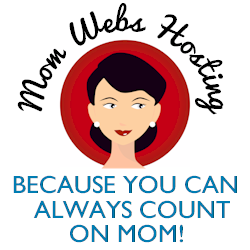 The free printable instant download PDF has both picture and word cards. The picture cards would be used with pre or emergent readers, and the words cards could be used with more independent readers. Click on the link below for your download. There are two pictures for each line of the song. You can easily see this is for little baby and don’t say a word. While these are Mockingbird and sing obviously. The cards could be matched as rhyming pairs in addition to sequencing or retelling the story. There is a Carol Thompson board book that has no shopping or buying in it! We got that book at a grandparents class and found out about the non-commercial version. The baby is shown a mocking bird, pappa makes a daisy ring, a washing line is tied, and mama makes a paper sailing boat. It is a very sweet version. Here is a picture of one of the word card pages. 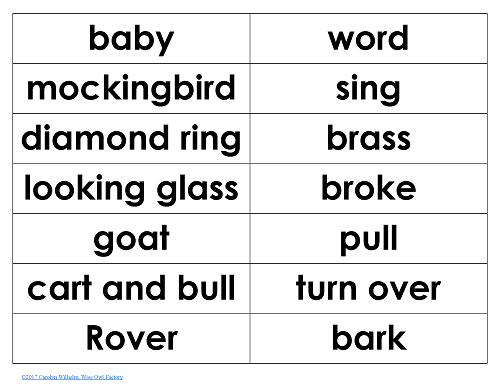 Words could be matched to pictures, used for retelling, or rhyming words be matched.